Joy Boruff, president/CEO of The Moline Foundation, presents a symbolic gift to Joseph Rives, WIU vice president for Quad Cities and planning, at a recent meeting in Moline. MOLINE, IL - High school students in the Quad Cities area will have an opportunity to take free courses in agriculture at Western Illinois University-Quad Cities, thanks to a recent gift from The Moline Foundation. The $100,000 gift will support a multi-year pilot program for area high school students to dual enroll in classes focused on agriculture science, business, technology and communication, according to Andy Baker, director of the WIU School of Agriculture. "With Quad Cities-area high schools primarily serving an urban population, there is a lack of awareness among students on the variety and abundance of job options and corresponding educational pathways to an agriculture-related career," Baker noted. 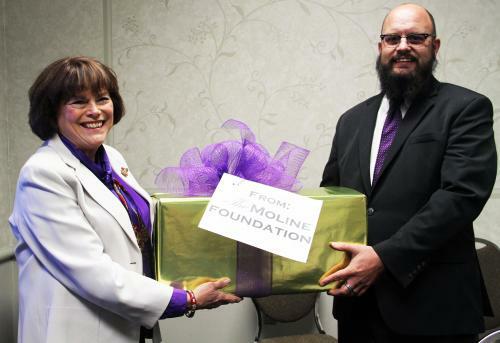 "We appreciate The Moline Foundation's continued support of Western Illinois University. The Foundation recognizes the needs of the region and that Western has outstanding academic programs and the potential to meet those needs," said WIU President Jack Thomas. "I would also like to express our gratitude to Andy Baker and the WIU School of Agriculture for being a part of this pilot program." The WIU School of Agriculture is one of Western's 12 Signature Academic Programs based on its international reputation in plant and animal research, internship opportunities and hands-on learning experiences, among other factors. "We are thankful and proud of our ongoing relationship with The Moline Foundation as Western Illinois University continues to grow and thrive in the Quad Cities," said Joseph Rives, WIU vice president for Quad Cities and Planning. "We are also equally as proud that this gift directly supports local talent development goals included in the Quad Cities Chamber of Commerce's Q2030 Regional Action Plan, as well as goals that enrich our offerings as outlined by the President's Executive Institute." The Foundation's gift will be used for courses tentatively scheduled for the Fall 2018 semester. Further details regarding course scheduling and specific curriculum will be announced at a later date. "With our previous initiatives with workforce development, The Moline Foundation could see a need for agricultural-based classes for high school students," said Joy Boruff, president/CEO of The Moline Foundation. "We are pleased to partner with Western Illinois University to assist in funding dual enrollment agriculture classes for Quad City area high school students. Agriculture is the number one industry in both Illinois and Iowa in terms of economic impact, contributing more than $8.85 billion to Illinois' economy annually. Ag-related industries in Iowa are 27 percent of the state's total economy. Clearly, there is an opportunity to educate our future workforce about the growth and availability of jobs and careers in this sector." The Moline Foundation encourages philanthropy and channels resources to meet the needs of the Quad Cities and the surrounding area. For more information, contact Baker at AJ-Baker@wiu.edu or (309) 298-1080; or visit wiu.edu/cbt/agriculture or molinefoundation.org.